The Butterfly is true wonder of Nature. It leads a short, yet amazingly eventful life and undergoes a drastic transformation in a relatively limited space of time. As a result, butterflies are often associated with Rebirth and Resurrection. In Christianity, the butterfly represents Christ's resurrection and his ascension to heaven. Butterflies are also symbols of Love and Spirituality. The Greek word for butterfly is psyche, after the goddess Psyche, the goddess of the Soul. Psyche is often depicted with the wings of a butterfly and, according to Greek mythology, she fell madly in love and married Eros, the Greek god of Love, Desire, and Affection. You may better know Eros by his Roman name, Cupid. Tribal patterns have a particular cultural meaning in the various regions from which they originate. Nowadays, the exact meaning of each tribal symbol remains unclear, but Tribal Butterfly tattoo designs generally embody a connection to Nature or a particular culture. Celtic Butterfly Tattoos are deeply rooted in Spirituality and Paganism, and point to strong connection with the natural elements and a link to the Irish culture. This tattoo design is a great way to add a gothic twist to a very feminine symbol. The fragile butterfly is given dark undertones and a Gothic Butterfly tattoo generally represent a loss of Innocence and Freedom. This butterfly is native to Australia and protected by law from poaching and hunting. While it has no definite symbolic meaning like the Monarch Butterfly, persons often incorporate the Ulysses butterfly into tattoo designs for aesthetic purposes. A Rebel Flag has various meanings, depending on how you view the meaning of historic events. For some, it is a symbol of Racism and Hate, but for others, it represents a strong connection with the American South. These tattoos offer a distinctly feminine touch to the traditional Rebel Flag and are worn by women who are proud of their Southern heritage. Of all the butterfly species, the Monarch butterfly is by far the most popular. In Mexico, Monarchs represent the return of the spirits of deceased loved ones and is celebrated as the Day of the Dead all across the country. Moving a dead monarch is considered to bring bad luck, since doing so means that you're disturbing the final resting place of your loved ones. Since butterfly tattoos are almost exclusively worn by women, it's no surprise that many issues relating to Women's Health often become incorporated into the designs. The pink ribbon is a widely recognized symbol for the fight against Breast Cancer. The Breast Cancer Butterfly tattoo represents Hope and Rebirth after the devastation of suffering from the disease. It is often worn by Breast Cancer survivors and their loved ones. The dragonfly is a creature of both Air and Water. Air symbolizes Transformation and Water represents the Subconscious and Meditation. Like the butterfly, it represents Freedom and Prosperity. A tattoo design with both animals also signifies Inner Peace. A skull represents a past life and mankind's Mortality. It's tempting to interpret a Butterfly Skull tattoo as being morbid and dreary, but in reality, this design symbolizes Growth and Transformation after a tragic event, like the death of a loved one. It also embodies a change in lifestyle and turning away from your old ways. The tiger is a symbol of Power, Strength, Passion, and Sexual Prowess. Tiger tattoos represent the innermost desire of man to be wild and untamed. A Butterfly Tiger tattoo design signifies the inner strength and dormant power of a creature like the butterfly, that normally appears so fragile. When paired with Fairies, Butterfly tattoos embody Femininity, Rebirth, Transformation, and Freedom. Both are elements of Nature, so persons wearing a Butterfly Fairy tattoo also have a deep bond with the natural world. The most common incarnation of this design is the Butterfly and Rose tattoo. The type and colour of the flower changes the overall meaning of the tattoo. A butterfly on a red Rose represents Passion, Love, and a transformation in your love life, while the presence of an Apple blossom signifies a change in luck and Prosperity. 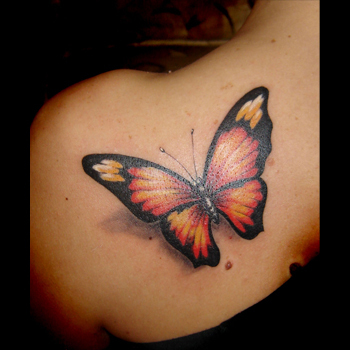 Generally, Butterfly and Flower tattoos are an expression of your love life. The star has a variety of meanings, most of which relate to good fortune and finding your way home. Throughout history, a star is used to guide someone to a particular destination or on a quest, while the butterfly embodies Freedom, Nature, and the Soul. Butterfly and Star tattoo designs represent guidance on a spiritual quest. Dragon Butterfly tattoos embody the interaction of Strength and Power versus Innocence and Beauty. A dragon is normally associated with masculine qualities, whereas a butterfly is often identified as a feminine symbol and is considered innocent and delicate. In a sense, a person wearing this tattoo design is identifying with how the two forces balance and complement each other. In many cultures, both a dragon and a butterfly are considered symbols of Prosperity and Luck. Angels are guardians of humans and messengers of God. Given the spiritual significance of the butterfly, a tattoo design that features both elements symbolizes the protection of an innocent soul. Persons who wear this tattoo design usually see themselves as the angel or the protector and feel that they've been tasked by a higher being (whether God or the powers of the universe) to guide and guard someone who's emotionally fragile. In many cultures, the eyes are the windows to the soul. A Butterfly tattoo that features a pair of eyes symbolizes the ability, or the need, to focus on yourself and 'look within your soul'. Usually people who wear this design are undergoing, or have undergone, a huge change that has caused them to reflect on their life and re-evaluate their priorities, for example, someone struggling with addiction. In a way, the wearer is on the path of transformation. When designing the new tattoo, you have to think about what your new tat will symbolize and where it'll be placed on your body. At the end of the day, the best designs are ones that have significant meaning, since your new ink can't be easily erased. If you need some inspiration, then visit our design page at www.itattoodesigns.com or take advantage of our Custom Design Service, where our team can design a truly unique piece for you.